Over ninety emissaries, educators, community and campus rabbis from all over the United Kingdom gathered this week to participate in the annual Chabad Lubavitch UK conference. The event, held in the elegant surroundings of the Palm Hotel in North West London, was the largest and most successful conference to date. It was also an occasion to celebrate the 50 years since the establishment of the Chabab Lubavitch movement in the UK, when Rabbi Nachman and Mrs Sudak, arrived in London as emissaries of the Lubavitcher Rebbe, Rabbi Menachem Mendel Schneerson of blessed memory. 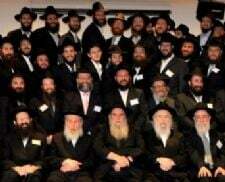 "It was amazing to see the increasing number of new faces that have continued to join the team over the past few years," said Rabbi Bentzi Sudak, chief executive of Chabad Lubavitch UK. The conference, chaired by Rabbi Pesach Efune, featured a wide range of workshops, presentations and sessions reflecting the diverse programming of Chabad institutions across the country. Guest speaker, Rabbi Aaron Dovid Gancz, a senior teacher at the Morristown Yeshiva in New Jersey, lectured on innovative and effective approaches in education, while PR professional Shimon Cohen provided expert advice on publicity and branding, and Andrew Kaye, of chairman of Chabad Lubavitch of Bournemouth, gave a lay leader's perspective. 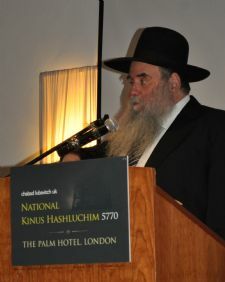 Rabbi Moshe Kotlarsky, vice chairman of the Merkos L'Inyonei Chinuch, the educational arm of the Chabad-Lubavitch movement, flew in from the United States to deliver the keynote address in which he emphasised the growing success of the movement in the United Kingdom since its humble beginnings 50 years ago. The highlight of the conference was the farbrengen (Chassidic gathering) which followed the formal proceedings. Rabbi Kotlarsky and Rabbi Ganzc led the farbrengen, creating a vibrant and inspirational atmosphere which continued until dawn. Commenting on the event, Rabbi Zalman Lewis, who serves students in universities on the South Coast, said: "The conference sessions and the contributions by Rabbis Kotlarsky and Gancz, as well as the general atmosphere, provided me with inspiration and a real sense of unity with my colleagues." "It has given me the nourishment I need to return to my position on campus in Brighton re-energised and with renewed enthusiasm."